We can’t believe it’s almost back to school time again! Time to start pulling together all of those classroom supplies, and get organized with pencil pouches, totes and backpacks to keep them all organized. And don’t forget the lunch box! Here’s some of our favorite free projects to help you stay organized for back to school. Keep small stuff like pencils, pens, erasers, markers, paperclips and more in place with handy pouches and holders. 1) Make a pencil pouch shaped like a doggie with Jessica Abbott’s Dachshund Pencil Case Tutorial. 2) Find little supplies easily in these easy to make clear pouches with the See Through Zipper Pouch tutorial from Amy at Positively Splendid. 3) Put colored pencils in their place with this simple to stitch Ribbon Pen and Pencil Case from our very own Jo here at WeAllSew. 4) Create a character case to carry small things with Ashley Johnston’s Metal Mouth Zipper Pouches – and just wait until you see the other pouch! 5) It’s easy to tell what’s in a pouch that looks just like it’s contents! 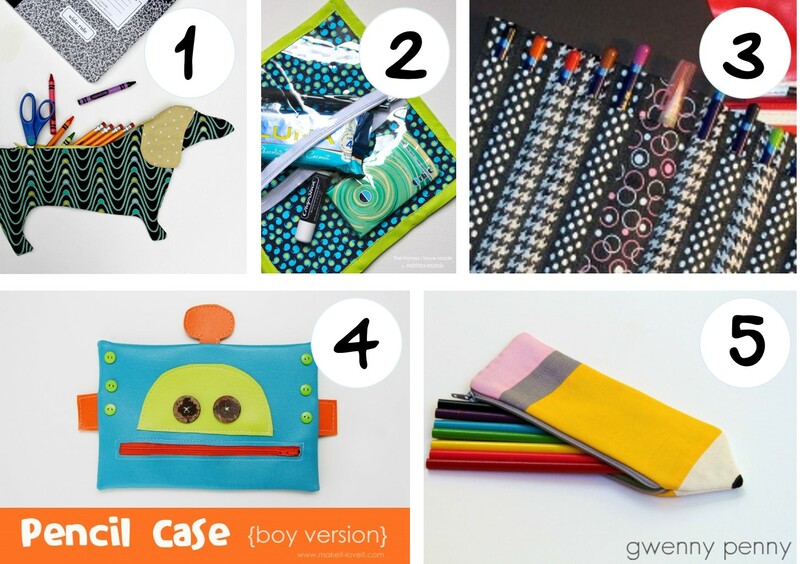 Check out Gwenny Penny’s very literal Pencil Pouch Tutorial. Keep books and files in line. Make custom covers to keep your books looking neat, and use these other book accessories to keep things in place. 6) Sew a simple book cover to keep your books neat and tidy, and there’s no mistaking which book is yours! Get the Book Cover Tutorial from 33 Stitches. 7) Keep you place in your text books with a bookmark that won’t slip out in your bag. Find the Easy Fabric Bookmark Tutorial from Simple Simon and Company. 8) Organize smaller books, notebooks, composition books and supplies in the Back To School Quilted File Folder tutorial from The Sewing Rabbit. Lunchtime is an important break for student’s to get re-energized for the rest of the day – make it fun with any of these lunch projects. 9) Sew a custom lunchtime silverware and napkin organizer with the Lunch Bag Cutlery Rolls tutorial from BurdaStyle. 10) Keep snacks fresh with reusable fabric snack sacks! Get the Snack Bag Tutorial from Owen’s Olivia. 11) It’s easy to see what’s for lunch in this fun see-through Vinyl Lunch Bag from The Inspired Wren’s tutorial! Carry it all in one place. Whatever you’re carrying to and from school, carry it in style with a handmade bag. 12) The Flap Happy Backpack tutorial from Sew Can Do makes a perfectly sized bag for any tot headed to school. 13) If flowery bags are not your thing, check out Conner’s Messenger Bag tutorial from Punkin’ Patterns – also perfect for any munchkin to tote to pre-school! 14) Make this tote with a fold-over top and shoulder strap out of your favorite fabric, it’s big enough to hold all of your school supplies. 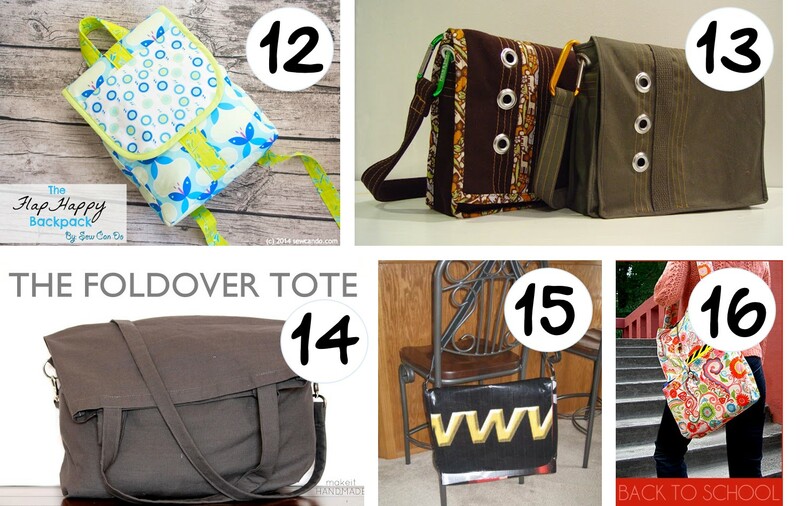 Get the Foldover Tote tutorial from Make It Handmade. 15) Use recycled billboard material (or any fabric you choose) to make a roomy messenger style bag using Stacy Schlyer’s Billboard Messenger Bag tutorial. 16) Stitch up this super-cool slouchy back to school bag with The Perfect Slouchy Book Bag tutorial from Sew 4 Home. Thanks so much for featuring my Vinyl Lunch Bag!